When Germans Augrimmer new full-length promo came across my desk not only I went back to re-read my thoughts from a few years ago, but I also re-listened with some distinct pleasure to their original MCD and first full-length From the Lone Winters Cold. 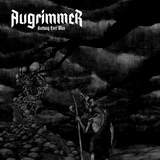 It is easy to see why Augrimmer’s very competent, if not the most original, melodic black metal endeared itself to Northern Silence, so that the label continues sticking with the band. On Nothing Ever Was, however, main songwriter and guitarist Nord decided to expand their take on the genre, while bringing more occult feeling and traditional metal approaches into their triumphant romps over Northern landscapes. From the very beginning of Barbarism Rises Augrimmer launches into a profound catchy riff and are not afraid to be melodic throughout the album. By the same token, they are also brave enough to uncork a lengthy fluid melodic solo or two, the progress of instrument wielding compared with From the Lone Winters Cold very evident (The Coffin Host, The Sad King of Mankind). It is if the band lost their inhibition and the necessity to conform to some boundaries. They confidently mix now blastbeats and traditional metal gallops (Barbarism Rises) and make seamless transitions between tremolo and rigid death marches (The Coffin Host). Taake and Windir still would have been proud of Augrimmer being able to capture truly Norsk feel with their riffs (Azure Doom), yet Nothing Ever Was has the band experimenting quite a bit more with ritualistic dark arts atmosphere, not being stuck in Northern desolation just for the sake of being truthful to facepaint makeup. Satan’s vocals are still mostly rickety Abbath-like croaks, but the album now brings out clean vocals in spots. In hymnical The Voice it mostly helps the music find its groove in cleaner choruses, but clean voice has the most effect in Heir of the Black Flame. Defeating boredom, it brings out and emphasizes diversity, at the same time not stooping into silliness and not emasculating these tracks. Heir of the Black Flame is Augrimmer standing at the edge of ritualistic traditional metal a la Merciful Fate and black metal of the mid 90s. Where the occult goes a bit too much is in the transitional track Harbinger of the Night, but thankfully it moves quickly and transitions into the final thrashy race which is The Janus Face. Another prominent feature of the album is Augrimmer’s ability to incorporate dark Spanish style acoustics into its tracks (The Coffin Host, The Sad King of Mankind, The Voice), although the band did that earlier on From the Lone Winters Cold. Not as intricate in that department as Keep of Kalessin flamenco forays on Armada, dark acoustic guitar rounds out the atmosphere Nothing Ever Was set out to create. Equipped with a little bit cleaner production than From the Lone Winters Cold, the album has all traits to bring out immediate ingratiation to the listener (similar in that regard to Blood Stained Dusk), but it does stand up to repeated listens well, perhaps even better than its predecessor. Not the trendiest band, and not the most experimental one either, Augrimmer continues to harbor qualities about itself which are bound to create a dedicated fan base.